1 How can I record higher scores? Open the content area. To record higher scores, please refer to the following tips. - Use fewer moves to activate the Popcorn Time and get many points quickly. - Remove many blocks at once by using Special blocks to get points for them. - When removing a special block, if there is another special block in the range, the score of that special block is also added. - The more combos you make, the higher your combo points. 2 How do I clear levels? (Missions) Open the content area. You can clear levels by completing their missions. The main missions are as follows. 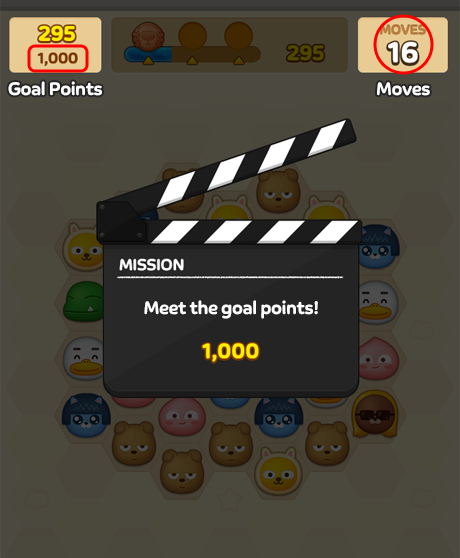 Remove blocks and reach the goal points to clear the level. 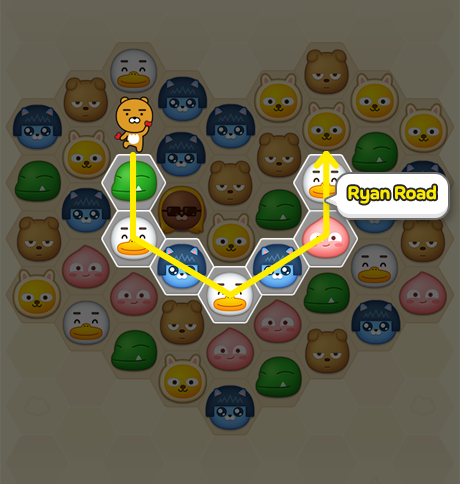 Remove tiles and create a path for Ryan/Neo/Frodo to move them to a certain location. - Blocks in their path will be removed. - Blocks around the Friend cannot be moved. Remove blocks around the grills and cook a set amount of meat to clear the level. 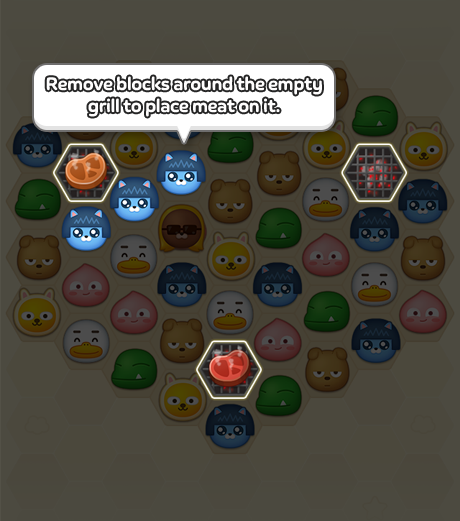 - Remove blocks around an empty grill to place meat on it. - Meat is fully cooked when turned 3 times. - If you stop turning the meat midway, it will get burned and disappear. Remove Sun blocks and turn all the dark blue Night tiles to Day to clear the level. 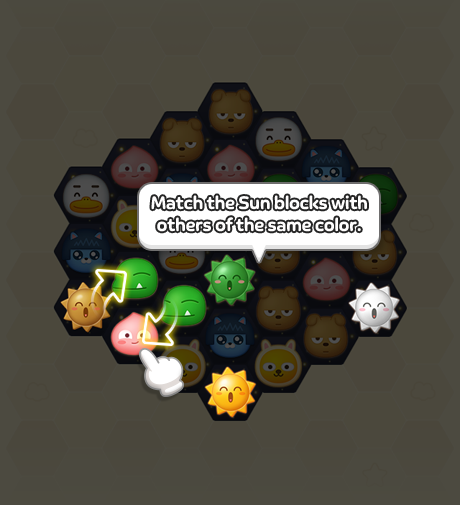 - Match a Sun block with blocks of the same color. The Sun block and 6 surrounding tiles will change to Day. - If there is an obstacle, then you must remove it before removing a Sun block to change to Day. 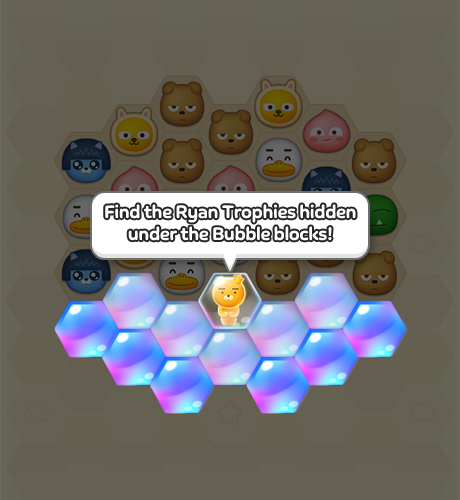 Pop Bubble blocks and find a number of Ryan Trophies to clear the level. 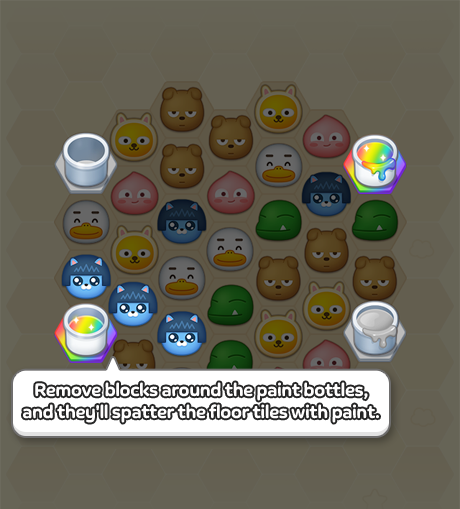 - You can pop Bubble blocks by removing surrounding blocks. Remove a number of tiles stained with paint spattered from paint bottles to clear the level. - Remove blocks around paint bottles, and they spatter floor tiles with paint. - You can remove the stained tiles by removing the blocks on them. 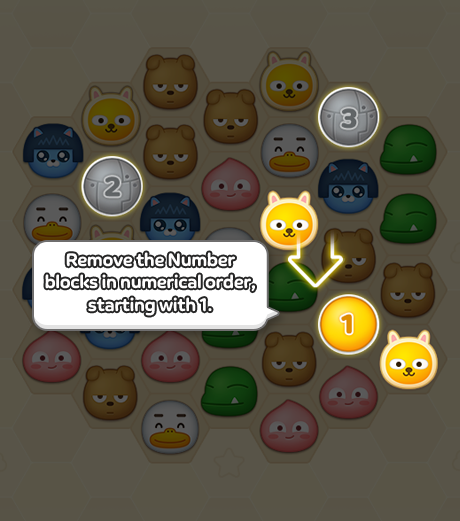 Remove Number blocks in order to clear the level. - One Number block is turned on at a time. - Only the lighted Number blocks can be removed. 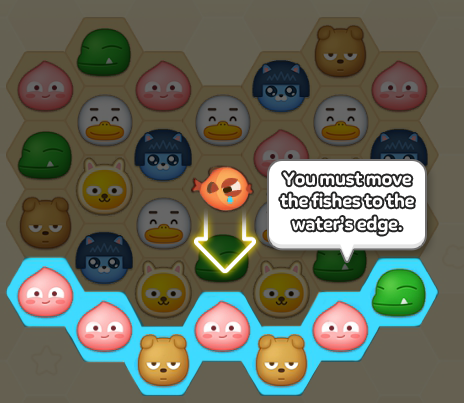 Move all the fishes to the waterside to clear the level. - Fishes move just, like other blocks. - Fishes are saved when they enter the water. 3 I want to turn off the SFX or BGM. Open the content area. If you do not want to receive push notifications or hear in-game sounds, then you can update your settings in the Settings screen. - Tap the cogwheel-shaped button at the bottom of the screen to turn on/off push notifications. - You can turn off the SFX/BGM even while playing a game by tapping Pause. 4 Tell me about Friends. Open the content area. All Friends give bonus points when blocks of the same shape as they are removed. 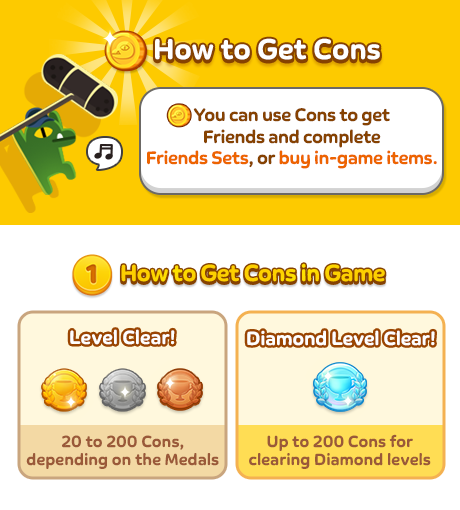 Certain Friends periodically generate Hearts, Gems, and Moves +2 items, or have a skill that creates a chance of generating Gold Ryans, Sunglasses, Hats, or Sunglasses and Hats blocks at the beginning of a game. For more information, please refer to each Friend's page. While playing up to Chapter 2 (24 levels), you can collect the Classic Friends Set. After Chapter 2, you can get Friends with various features through the Gacha System. You can use the Gacha with Gems and Cons as well as Lucky Gacha Keys, which you can get as Event/Friend Level-up rewards. You can also get limited edition Friends by clearing the Gold Bonus level for each chapter. You can level up your Friends by increasing their EXP during games or using Friends of the same kind that you found through Gacha. Every time a Friend reaches a new Level, their point bonus and skill improve, and they also randomly generate Cons, Hearts, Lucky Gacha Keys, Gems, and other rewards. You can collect your Level-up rewards in the Game Results screen or on the My Friends page. Collect all 8 Friends of the same kind in the Friends Collection Book, and you will get Gems or a set Friend as a Set Completion reward. Also, equip a set of 8 Friends in the Collection Book, and they will periodically generate Hearts and Set Chances. Generated Set Chances can be used anytime during games to instantly add a set number of moves. On the My Friends page, tap the Replace Friend button at the bottom of the screen to equip a different Friend. Note that if the Friend being replaced has a periodic production skill, then its production time will be reset. You can select and change your Leader Friend among the Friends that you are equipped with. On the My Friends page, select the Friend you want and tap the Leader button to make it your Leader. 5 Tell us about Friends Fuse Open the content area. 6 The Objective Completion count doesn't increase even if I complete the mission. Open the content area. Objective Completion requires you to perform a mission a certain number of times. Performing it on Event stages, however, does not count. Please clear normal levels to complete Objectives. 7 What are Gems? Open the content area. Gems are a Cash currency used in Friends Popcorn. They can be used for buying items and Hearts and getting Friends through Gacha. - Buy them at the Gem Shop. - Clear Gold/Diamond Bonus levels. 8 What are Gold/Diamond Bonus levels? Open the content area. A bonus level is unlocked when you clear all the levels in one chapter. the Diamond Bonus level, at Diamond Medal. The Gold/Diamond Bonus levels offer Gems and limited edition Friends when cleared. ※ Certain limited edition Friends can only be found on Bonus levels. 9 What are Hearts? Open the content area. You need Hearts to play all levels in Friends Popcorn. You get 5 Hearts by default, and every time you fail a level, you will lose 1 Heart. When you have fewer than 5 Hearts, 1 Heart is charged every 30 minutes. If you want more Hearts, you can buy them with Gems or ask your friends for them. 10 What is the con? How can I get it? Open the content area.